Have you ever wondered how small, complex metal components are shaped and cut? It seems incongruous that such tiny pieces can be crafted to such precise measurements and uses. The machine responsible for this marvel is the lathe. Industrial grade lathes weigh upwards of a couple of tons and have a similarly out of reach cost. In addition, they perform tasks that are of little use to small time DIY enthusiasts and skilled craftsmen like jewelers and locksmiths, who require a machine that can work small parts and don’t require the precision and exactitude of larger machine room lathes. 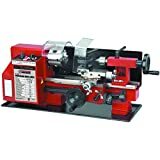 The mini metal lathe is, therefore, a boon for hobbyists and small repair operations because they offer an affordable, yet reasonably sized lathe that can be housed quite comfortably in a garage or work space. Short of building your own lathe, mini lathes are affordable and convenient. This miniaturization invariably leads to an accepted reduction in machining accuracy and features, and this is understood by workman as a reasonable compromise. Mini lathe do, however, work within the functional tolerances of many shaping techniques making them versatile tools. In our guide, we shed some light on the mini metal lathe market, highlighting a number of models that we deem to be worth your time and money. As always, we have relied on value, features and performance as qualitative measures to help us make our choice. We also hope to provide some information on how to best go about shopping for a mini metal lathe. Historically, the concept of the lathe dates back to 1300 BC Egypt and has evolved over the centuries into various types that can machine a wide variety of materials including wood, glass, plastic and metal. A mini metal lathe is a type of lathe whose purpose is to accurately machine metals and foten other materials in a cylindrical manner. They are used to craft a huge variety of items and have numerous applications. Metals usually worked are steel, aluminum and brass. Other materials include plastics like Teflon. 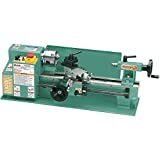 Mini metal lathe aren’t generally designed to work wood and it is possible to get dedicated wood lathes designed to do just that. The main purpose is to machine materials in an expected and repeatable fashion over and over again. This is important in the sense that the pieces crafted much adhere to strict parameters to be functional when incorporated into their final resting place as part of a device, fixture or other machine. An example is a hobbyist using a mini lathe to create tiny pieces required for a toy train engine that need to be detailed with a reasonably minimal scope for error or deviation. They can even be used on some fairly outlandish projects too. Mechanically speaking, by way of a fixed tool, bit or drill that adopts an adjusted and linear trajectory, a mini lathe sheds and shapes metal attached to a rapidly revolving fixture called a chuck powered by a variable speed motor. The motor and chuck are incorporated into the larger headstock, which is made of strong, durable materials designed to handle the pressure created by the bit. This is to ensure the metal being machined is held in place and does not vibrate. Vibrations or even the slightest movement can affect the quality of the machined piece. A chuck is essentially a jaw that crabs the metal being worked on. Inside the headstock is a spindle running on a set of bearings, attached to which is the chuck, acting as a means of securing workable materials. The headstock also has a range of speed controls to determine the rotation speed of the spindle and chuck. The headstock rests on a strong base called the bed that allows the other parts of the lathe to be shifted closer or further from the chuck as required. The movement is assured by a linear actuator; a round gear that moves a mobile track. As the gear moves it engages treads in the track and creates a straight, linear movement along the length of the lathe. Attached to this is the carriage, or bit holder that travels along a drive shaft connected to the actuator. The carriage consists of a tool turret, or tool holder, and a set of adjustable clasps to secure angle and heights. On the other side of the mini lathe, directly opposite the headstock, is the tailstock, which is used to secure tool bits by way of another motionless spindle and taper. The tailstock allows head on machining of material rather than the sideways work undertaken by the carriage. The speed, measured in rotations per minute (RPM), determine the intensity of the spindles rotation. Varying speeds and the ability to make adjustments allow for different threads and shapes to be made on the material being machined. If you are planning multiple projects with different specifications, make sure you opt for a wide speed range and variable speed controls. Lathes are not toys and can lead to serious injuries or worse. We appreciate manufacturers that implement safety features to minimize the risk of injury. We recommend you take the same approach and opt for a lathe that is safe. The thread range of a mini lathe, measured in threads per inch (TPI), determines the accuracy and size of the material being taken off the part being machined. Depending on the size of the pieces you need to make, choose an appropriate thread range. The smaller the required thread, the smaller the range and vice versa. Different thread ranges also cater for different types of material so check up on this before making a purchase. Swing is the measure of how much a tool turret can be moved horizontally across the width of the lathe. This allows different parts of the material to be worked on. The space between centers is essentially the gap between the center on the chuck and the center on the tailpiece. A center immobilizes a part in a concentric fashion for consistent threading along the length of the material. A larger swing allows more versatility in machining and more space between centers caters for a large part to be worked on. Again, check what your project requires and buy accordingly. Our top pick for a budget mini metal lathe is the Grizzly G8688. Weighing in at a very respectable 74 pounds, the Grizzly is powered by a variable speed ¾ horsepower, 110 volt single phase motor capable of up to 2500 RPM. The bed is made of high quality precision-ground cast iron for maximum sturdiness and is equipped with a chip tray and back splash guard to catch any stray materials while in use. The headstock and body are also constructed with cast iron. The thread range is between 12 and 52 TPI, and has 18 standard thread pitches, as well as 10 metric thread pitches, allowing for a decent amount of detail on smaller parts. The space between centers is twelve inches and the swing is seven inches. The chuck has three external jaws. The turret can accommodates tools up to 5/16 inch. We also liked that the Grizzly has both a metric and inch hand wheel graduations, and a threading dial indicator informing users as to the exact measurements of the thread being machined. It also ships with service tools, a four-way turret post and a steady rest. No tool bits are included, but then this is fairly standard within the mini lathe market. Overall, the Grizzly is surprisingly versatile for the cost. It won’t handle the most precision hungry jobs, but works well as a hobby lathe and for some low-accuracy commercial operations. It will fit comfortably next to other power tools in a machinist’s arsenal. For a little more money, we found the Erie Tools Mini Metal Lathe to be the most cost-effective option on the market. The Erie Tools runs on a variable speed 0.53 horsepower single phase motor motor with an adjustable speed from 50 to 2500 RPM. The spindle has a digital readout so you always know how many RPMs are being produced. It can also rotate in either direction for left handed threads. The swing is seven inches and the space between centers 14 inches. The range of threads is between 12 and 52 TPI, in both metric and inch measurements. The chuck is fairly standard and offers an auto feed feature that is adjustable to the requirements of the project at hand. The tool post houses 5/16 inch bits and holds up to four cutting tools at a time so you can quickly shift to a different thread type very quickly and efficiently. The Erie Tools ships with both internal and external chuck jaws, slides, eleven feed rate gears and a much appreciated five-piece cutter kit so you can get to work immediately. We appreciated the manufacturers attention to detail with the pivoting plastic shield that covers the chuck. It is a reasonable lathe for the price, though don’t expect it to cut like more expensive, full-sized lathes. You definitely get your money's worth and it performed well when tackling small threading tasks. Our top end mini metal lathe of choice is the BestEquip Mini Bench Lathe. It sports a 750W single speed motor capable of churning out speeds between 50 and 2500 RPM with variable speed controls. Made with high grade iron, the Mini Bench is durable and robust. The gears are also made of metal to limit breakage. Ideally the machine shines most when working on precision parts and small modelling pieces though it can excel in other areas due to its versatility. There’s also a backslash and chip board to pick up debris. The thread range sits between 8 and 44 TPI. It has a 8 and ¼ inch swing, and a 15 and ¾ inch space between the centers. Larger than smaller models and, therefore, capable of housing larger parts for processing. It accepts tool bits up to ⅜ inches via a four way turret. It ships with two chucks, one with three jaws and another with four jaws for stability, as well as a tool storage box, an oil can and accessories for assembly. Overall, the Mini Bench is a device made for precision with the low thread range and when tested it performed admirably well. The various features are also well-rounded to offer a versatile machine perfect for hobbyist and small scale professional setups. Our beginner pick is the Central Machinery Mini Lathe. Here, we have a variable speed lathe powered by a ¾ horsepower single phase motor with speeds from 0 to 2500 RPM. The thread range is 12 to 52 TPI and includes an auto feed feature. The swing is seven inches and the center space is 10 inches. Small, but enough for a beginner to get to grips with without feeling overwhelmed. We chose this model for beginners mainly for the safety features that could be crucial as a novice learns to navigate a lathe. Notably, the plexiglass guard on the chuck which has a micro switch and the guard attached to the carriage that covers the tool turret. In addition, it is made of durable iron for durability and, more importantly, stability. The 18 threads also give a beginner a good margin of options to perfect their skills. It is also very compact and fairly easy to assemble with the instructions. The price also means that you are not breaking the bank for your first lathe. It also means that if you discover that lathe work isn’t your thing, you won’t feel too bad about the money spent. 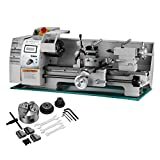 We see the Central Machinery Mini Lathe as a great beginner lathe with all the desired features to make good precision parts for hobbyist, model builders and even small scale fittings for commercial use. We found the controls responsive and it was straightforward to assemble. If you need something compact, we recommend the Shop Fox M1015 as a great option. It weighs 78 pounds and uses a ⅕ horsepower single phase motor to rotate the spindle at up to 2000 RPM. The lathe is made of heavy-duty cast iron for durability and it ships with a splash guard and chip tray. There is a protective plexiglass cover for the chuck as well. The thread range is 16 to 24 TPI with settings at 16, 18, 19, 20 and 24. Not the smallest TPI available, yet enough for some quality precision work on guns, models and tools. We have a swing over the bed of six inches and the carriage can travel up to 10 inches in the space between centers. It also comes with a standard three jaw chuck and a turret that takes bits up to a size of ⅜ inches. There’s an auto feed function as well as a manual one. You can easily switch between these thanks to a useful feed clutch. The M1015 is adjustable thanks to a rotation direction knob, speed dial and a handy threading chart to help choose the right gear for your project. It ships with a nice selection of accessories including an oil can, a selection of wrenches, and a set of gears. The size of M1015 is what makes it stand out. Even the smallest workshop can find a space for it. Don’t let the small size convince you otherwise, it packs a punch and a set of features that will have even the most versed hobbyist occupied for hours. Low cost mini lathes have a tendency to malfunction due to faulty electronics, blown fuses and rotation speeds that aren’t quite powerful enough to get the job done. 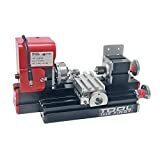 In terms of finding a mini lathe that is simply reliable, we invariably agreed that the Mophorn Metal Lathe was our go to product. A 0.75 horsepower variable speed motor allows the spindle to rotate at speeds between 50 and 2500 RPM. The construction is defined by high quality welding between the parts for robustness and there’s very little vibration when the spindle is powered up. As such, threading and cutting is precise and accurate. Overall, it weighs 83 pounds. Not the lightest by any stretch, but this is indicative of the lathe’s good construction standard. The swing is fairly normal for these sized lathes at seven inches. The carriage is adjustable along the 14 inch space between centers, a rather larger distance for this type of model. 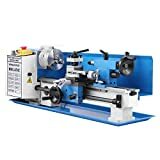 This lathe is ideal for standard threading, but also turning and cutting for numerous applications within the hobbyist scene and also as an educational tool and small scale commercial enterprise machine. The range of threads is 12 to 52 TPI which gives a decent amount of precision range. The chuck has three jaws and is larger than expected at four inches. It offers forward and reverse rotation. The tool turret supports bits with a size of ⅜ inches. The Mophorn ships with a set of wrenches and nylon gears, a protective mask, oil can and shockproof cushions. The only thing missing are tool bits. Though it is made in China, the M1015 performed reliably when we had a spin on it and was able to thread, cut, drill and turn aluminum, brass and delrin blocks very well. With this in mind, we found it to be the most reliable mini lathe on the market. If you are really stretched for cash and getting a mini lathe is imperative, we would recommend the Signswise Mini Metal Lathe. However, we make this recommendation with some reservations given the low cost. Manage your expectations and understand that it won’t offer the functionality and reliability of pricier alternatives. See it more as a good starting point to learn the skills required to thread and cut metal using a lathe. The Signswise is surprisingly fully constructed with aluminum alloy, zinc alloy and some ABS parts, and sports an uncommon shape. It is compact and weighs only 7.25 pounds. This mini lathe is significantly smaller than the other models listed in our guide. It is primarily for very small scale work and works best with wood, plastic and soft metals like aluminum and copper. It can bore, turn, thread and drill these materials well. The size does limit how much it can do and we see it more as an amateur machine for someone who has a modelling project with not so strict tolerances in terms of precision. It is powered by a 24 W motor capable of attaining speeds of up to 20000 RPM. A maximum speed that needs to be viewed in context given it isn’t designed to machine hard metals. It includes an overheat feature that shuts it off if the motor gets too hot. The spindle can rotate both forwards and backwards. The speed is also fully adjustable with a stepless regulator. The carriage can travel up to 140mm in the space between the centers, so very small and ideal for the projects mentioned above. There’s no swing due to the small size. The chuck is proportional and, therefore, tiny, capable of housing materials with a maximum diameter of 20mm. We reiterate that this isn’t a lathe for high quality machining and won’t cut it even for small scale professionals. It is, however, a useful machine for work that doesn’t need to be perfect and should work very well for wooden model builders and the like.